Camera and fibre optic technology employed in Laserliner visual inspection kits for difficult inspection and maintenance tasks. RS Components (RS) has introduced two new inspection kits from Laserliner, offering maintenance engineers and technicians visual inspection capability in areas that are difficult to reach or in potentially dangerous environments. The first kit is the Laserliner VideoFlex G3 Ultra Plus for professional recordable digital video inspection, which is exclusive to RS and is a useful and affordable bundle set that includes a VideoFlex Control Unit and a choice of two interchangeable ultra-slim snake cameras: the VideoFlex G3 Ultra and the FlexCamera G3. The video control unit includes a rechargeable lithium battery pack, high-resolution 3.5in colour display, and integrated still image and video recording functionality. It offers 1.5 times digital zoom (in 10% steps) and a 180° rotation function, and data storage via the supplied 4GB SD memory card (expandable up to a maximum capacity of 8GB). The VideoFlex G3 Ultra and the FlexCamera G3 cameras offer a small stainless-steel 9mm camera head, featuring four high-performance LED lights for high visibility. The cameras come with 10m and 1.5m of reinforced feed cable, respectively, and are rugged, shock resistant and fully waterproof to IP65 and IP68. Both cameras also come with lens cover and camera impact protection. In addition, the bundle includes a robust Sortimo L-BOXX case to house all the components and accessories of the kit. 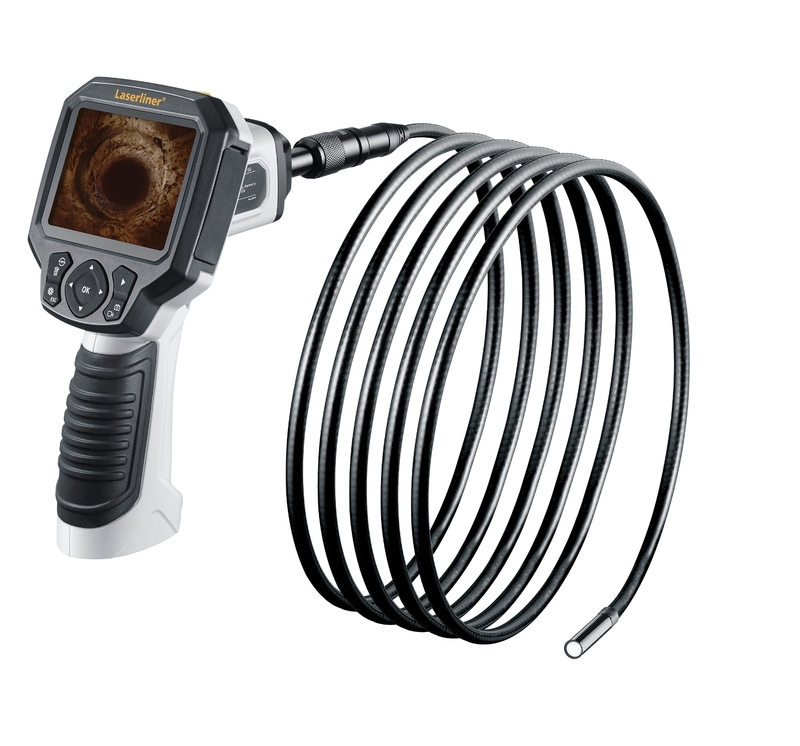 The second kit available from RS is the Laserliner PipeControl Mobile Inspection Camera Set, which is a rugged and affordable professional video inspection camera and is also ideal for drain inspection. The bundle includes a flexible 20m-cable snake camera with a small 25mm stainless-steel head and camera protection system. Rugged and waterproof to IP68, the camera offers a dozen high-performance LEDs for high visibility. The kit’s video control unit, which is a robust and shock resistant device that is waterproof to IP65, offers a handheld 5in TFT colour screen with a two-times digital zoom (in 10% steps) and 360° picture rotation function. The unit comes with a rechargeable lithium battery pack and features an integrated still image and video recording function, with recorded images stored on a 2GB video card (up to a 16GB maximum capability). The kit includes a lens cover and camera impact protection, as well as a Rolladapter for axial alignment of the camera unit in pipes up to 96mm, and also comes with a Sortimo L-BOX X case to fit in all components and accessories. Both kits include a TV-out connection, multilingual on-screen display, webcam function and are both wireless ready for cordless image transfer. These kits from Laserliner are available now and strengthen the existing comprehensive range of inspection products that RS stocks, providing solutions to help address countless needs across industries including plant maintenance.